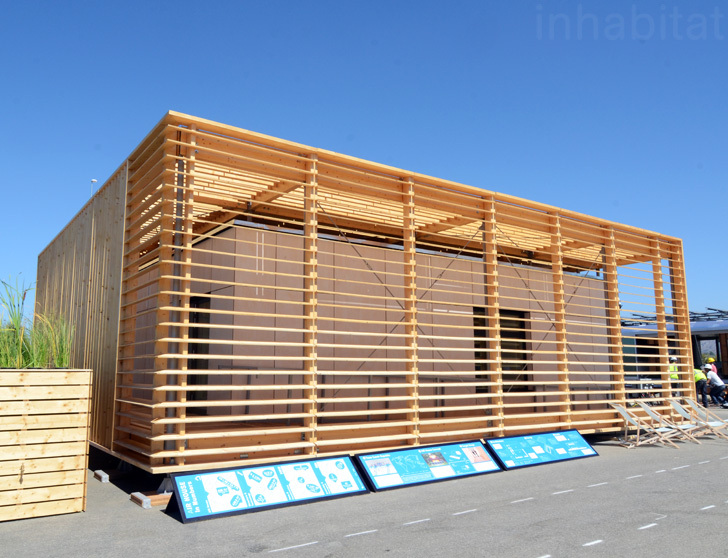 Team Czech Republic was just announced the winner of the coveted Architecture Contest at the 2013 Solar Decathlon for their beautiful, energy-efficient AIR House! For their first appearance at the DOE competition, the Czech Technical University team spent nearly two years designing and refining their unique prefab "building within a building." Although the project's L-shaped plan is a common configuration seen in many modern homes, what really makes the AIR House stand out is its slatted wood skin, which shades the interior while giving the structure a light, organic feel. 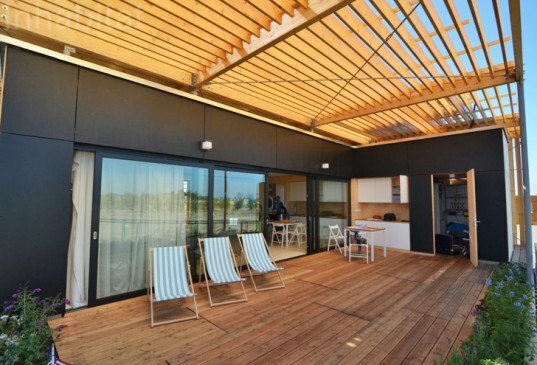 The jury evaluated the competing houses based on their architectural elements, holistic design, lighting, project documentation and ability to inspire and delight Solar Decathlon visitors. Stevens Institute of Technology claimed second place with 96 points, and University of Southern California took third place with 93 points in this particular contest. The AIR House was developed as a net-zero prefab home built for “empty nesters” seeking refuge in the countryside. The team wanted to create a home that would emphasize outdoor living, so they developed a simple interior complemented by a generous deck with space for cooking, gardening, relaxing, entertaining, and even storage. The relatively small size of the interior living space also speaks to the tradition of minimal, social housing found throughout the Czech Republic. The composition of the AIR House’s main volumes is primarily based on a “house within a house” concept, wherein an inner volume is shaded by a louvered exterior structure. The thermal envelope of the first skin is constructed using massive wood panels and natural wood fibers. The second skin consists of a slatted wood canopy. This second skin protects the first from sun and the wind while generating electricity and hot water through photovoltaic and solar-thermal panels attached to its structural elements. This exterior skin also eases the visual mass of the home, transforming a would-be bulky cubic structure into an airy form that plays with light and shadow. All of the AIR House’s energy needs are provided by 538 square feet of PV panels, and the prefab is also equipped with smart home controls. Given the climate of the Czech Republic, the home is intended to be ventilated naturally most of the year. However, for the purposes of this competition and the warm Southern California climate, the CTU team developed a system to recuperate waste heat from the home. The heat recuperation HVAC system ensures optimal air exchange, and during ventilation it minimizes heat loss (which accounts for up to 40% of energy loss in standard family houses). Domestic hot water is provided by two flat-plate solar thermal collectors. The heat trapped inside the collector is transferred by special antifreeze solar fluid into an integrated heat storage tank. In the climate conditions of central Europe, the solar system can cover 50-60% of domestic hot water needs throughout the whole year (100% in summer, and 10% during winter months). In periods of low solar insulation, the solar hot water system will be supplemented by an air-to-water heat pump. Additionally, a greywater system collects and filters water from the showers and wash basins to irrigate plants. Low-flow fixtures reduce water use further. The home traveled far to find its place in Irvine, California, and it will have a long journey home once the Solar Decathlon ends, but given the home’s simple foundation, small size, and uncomplicated form, the team should have no problem bringing it back to life in their idyllic countryside. The AIR House was developed as a net-zero prefab home built for "empty nesters" seeking refuge in the countryside. The team wanted to create a home that would emphasize outdoor living, so they developed a simple interior complemented by a generous deck with space for cooking, gardening, relaxing, entertaining, and even storage. The relatively small size of the interior living space also speaks to the tradition of minimal, social housing found throughout the Czech Republic. The composition of the AIR House's main volumes is primarily based on a “house within a house” concept, wherein an inner volume is shaded by a louvered exterior structure. The thermal envelope of the first skin is constructed using massive wood panels and natural wood fibers. The second skin consists of a slatted wood canopy. This second skin protects the first from sun and the wind while generating electricity and hot water through photovoltaic and solar-thermal panels attached to its structural elements. This exterior skin also eases the visual mass of the home, transforming a bulky cubic structure into an airy form that plays with light and shadow. All of the AIR House's energy needs are provided by 538 square feet of PV panels, and the prefab is also equipped with smart home controls. 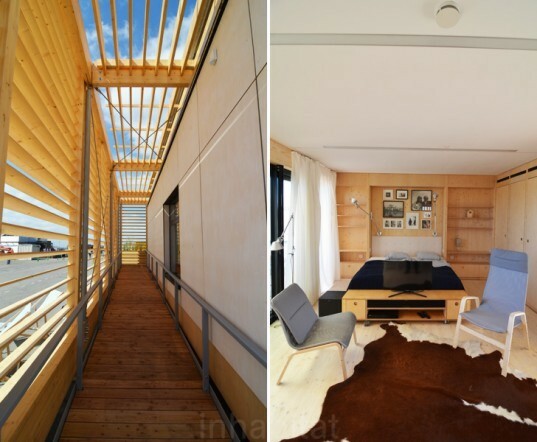 Given the climate of the Czech Republic, the home is intended to be ventilated naturally most of the year. However, for the purposes of this competition and the warm Southern California climate, the CTU team developed a system to recuperate waste heat from the home. The heat recuperation HVAC system ensures optimal air exchange, and during ventilation it minimizes heat loss (which accounts for up to 40% of energy loss in standard family houses). Domestic hot water is provided by two flat-plate solar thermal collectors. The heat trapped inside the collector is transferred by special antifreeze solar fluid into an integrated heat storage tank. In the climate conditions of central Europe, the solar system can cover 50-60% of domestic hot water needs throughout the whole year (100% in summer, and 10% during winter months). In periods of low solar insulation, the solar hot water system will be supplemented by an air-to-water heat pump. Additionally, a greywater system collects and filters water from the showers and wash basins to irrigate plants. Low-flow fixtures reduce water use further. The home traveled far to find its place in Irvine, California, and it will have a long journey home once the Solar Decathlon ends, but given the home's simple foundation, small size, and uncomplicated form, the team should have no problem bringing it back to life in their idyllic countryside.